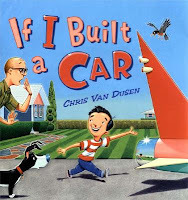 I started with If I Built a Car by Chris Van Dusen. This was last year's Monarch winner, so I was a little afraid that the kids would be sick of it. A couple of them knew it... and loved it! This one even coaxed one of the older boys down from his perch on the back of the risers (i.e. where the "cool kids" sit). After driving home in his dad's boring station wagon, a boy imagines the car he would build. It has a pool inside, an automatic snack machine, and it can go underwater and up in the sky. The rhyming text is fun to read and it's the perfect length. 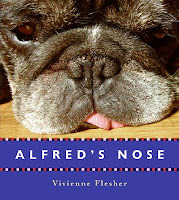 Next, I read Alfred's Nose, a quirky little picture book. I wish that it was a larger size and that all of the pictures were nice and clear. The kids liked this one, but who doesn't like dogs? The story's a little strange, but it's the pictures that make it fun. Alfred is a dog with a round head, a flat nose, and a tongue that sticks out all the time. When he finds a box of costume animal noses, he tries them all on to find one he likes better than his own. 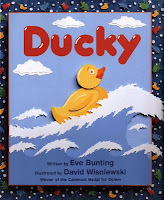 Then I read Ducky by Eve Bunting. The story's based on the true story of the shipment of bath toys that crashed in a storm and drifted up on beaches in Alaska and the Pacific northwest. The story itself is written from the perspective of one of the plastic ducks, alone and afraid as he bobs along in the ocean. The language is a little young for most of the kids in the group, but I read the author's note before I read the story and explained that it was based on a real event. That seemed to hold their interest pretty well. Last, but certainly not least, I finally read Don't Take Your Snake For a Stroll by Karin I reland. I've been wanting to try this in storytime for awhile now and it always seemed to be checked out or I forgot about it. I think maybe I found it a little funnier than the kids found it, but it's got silly rhymes and even sillier pictures. The reader is urged not to take their elephant to the beach, their pig to the mall, or their alligator on a late night walk. Each of these will surely result in dire consequences. David Catrow does the illustrations, so you know they're hilarious. My favorite is the elephant, so wide he nearly fills the page spread, wearing a yellow Speedo. This made for a good readaloud, but would also be great for individual reading because there are so many funny details in the pictures. They all seemed to go over well, but the big surprise for me was that the kids requested that I bring Big Plans next time. I read it last month and I didn't get a big reaction from them, but it must have stuck in their minds! That was the first thing they asked me when I got there: "Did you bring Big Plans I Say?" And as I was leaving they asked me to bring it next time. As any librarian knows, it feels really good to introduce kids to books they like and remember! I think Eric Carle's book 10 Little Rubber Ducks is abut the same event. It's a great story, but like Ducky, maybe for a younger age (probably preschool). If I Built a Car looks like a great storytime pick! I'm adding it to my next order list right now. Good idea on mixing up the titles. I usually pick one author and introduce him/her to the students. I've done Don & Audrey Wood, Eric Carle, and last Monday was Ed Young. The kids looove looking for the wolf in Lon Po Po.